View home close to Okanagan Lake / Aug 19-27 open!!! Book NOW!!! Enjoy this lovely treed one acre property just a stones throw to the lake. Contemporary 3 bedroom , 3 bath home with all the amenities you would expect in a vacation home. Sit back and take in the exceptional lake vistas from the large deck or dine el fresco on our side patio shaded by the cedar trees. We have a semi private tennis court next door with basketball hoop. Many walking /hiking opportunities in the area. Local beach/park just minutes away. We welcome to come experience our home , relax and enjoy all that the Okanagan has to offer. Pictures do not do this justice . Stunning panoramic view of Okanagan Lake from almost every room. Modern island kitchen with fridge , wall oven , jennair cooktop, dishwasher , microwave , pantry. The house is absolutely beautiful with a view of the lake from every room. Sonya and John were wonderful hosts. It was a fantastic family getaway spot. Would definitely book again! What a beautiful house! The view was so nice and great to wake up to. So picturesque. Very quiet neighborhood and easy access to hiking. Sonya was great. She was so easy to reach if you needed anything or had any questions. She thought of everything at the house, so it was definitely a home away from home. Thank you for agreeing to let us have my daughter's rehearsal dinner at the house. As promised, we ended the dinner on time. Would highly recommend staying there and would gladly stay there again! We were out with our family and rented this house for the week. It worked so nice for the 8 of us and then the rest of the family felt free to stop by. We had our suppers together and this home is so nice to move around in and we never felt crowded. The teenagers and adults loved the tennis court. Even tho it was a very smokey week, we had some idea of what the view of the lake would be like in clear weather. Super location! Loved being out away from the hustle and bustle of the city, but still close to all the attractions. House is furnished so comfortable, and a well supplied kitchen. Was so thankful there was a large roaster!! Missed finding the carrot peeler.... But otherwise would come back in a minute!! Thank you John & Sonya for your attention to detail!! the views are spectacular. when it's very hot in the afternoon on the deck, there is a great shady location to sit and eat dinner and still get a great view of the lake. The beds were very comfortable and the host was very accommodating in providing tools to fix our boat. The kitchen is also well stocked and a bottle of great wine awaited us. Would stay here again. Take care and we hope we will see you again. 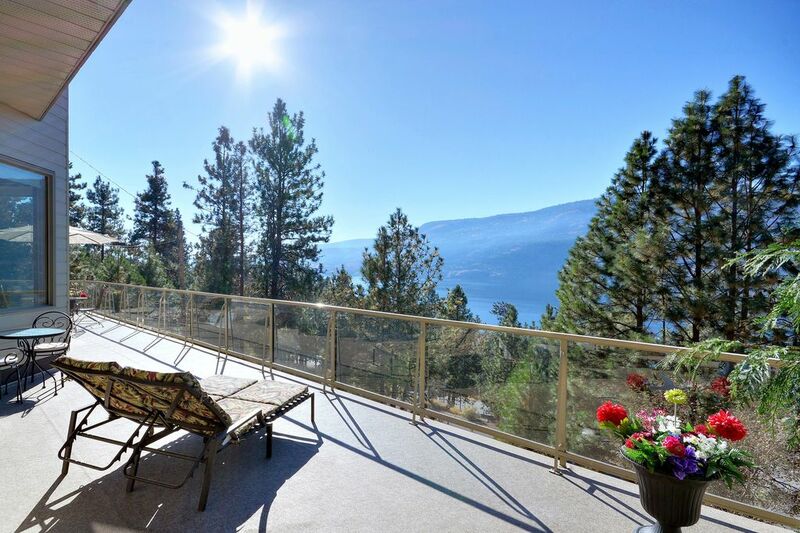 The house was just as described amazing with a great view over the Okanagan Lake. Sonya and her husband were very hospitable and helped us with tips for beaches and others. Thanks for the stay!